My boyfriend likes really bad Chinese food—the beige and greasy kind, served in karaoke bars and bowling-alley card rooms. So early on in our relationship, when he told me he wanted to try a teeny-tiny Ravenna Italian restaurant, with a cartoonish red and green sign that gives off a Mama-Mia-You'll-Love-Our-Spaghetti! vibe, I was quick to put him off. "Da Pino!" he would suggest, over and over again. "I hear it's really good!" But—much to my relief—it always seemed to be closed. Until, one day, it wasn't. We walked up to Cafe da Pino around seven o'clock and saw two men in soccer jerseys through the open window, happily chatting over plates of food at one of the restaurant's four tables. But when we walked through the open door, we were met with the crossed arms and stern look of Calabrian chef-owner Pino Rogano. Thunder crackled and lightning flashed in the distance. "Hi! Can we get a table?" "Are you still serving dinner? It says you're open until eight?" "Come on, Pino! Let them sit down!" the soccer guys said, laughing as they sipped their red wine. "Yes, he's open. Come in, come in! Sit! Sit!" He gave in, motioned us to a table, and walked behind a refrigerator case stacked with meats and cheeses, into the kitchen. My boyfriend and I looked at each other, incredulous. We sat down, and Pino quickly returned to our table and poured us glasses of water. "Ready to order?" he asked. "Can we see a menu?" I smiled up at him, hopeful. His bushy eyebrows moved closer together, like caterpillars facing off for battle. In the distance, lightning flashed a second time. "Do you like beets?" he asked, ignoring my menu request. "You'll have the beet ravioli." His eyes locked on mine, but I jerked my gaze from his stare. "Um, I'm not really... Can you just give us a few minutes?" Wordlessly, he walked back into the tiny kitchen. I leaped from my seat and ran to the door, where a menu was posted. I scanned it quickly, hoping I wouldn't get caught. InsalataCapreseRavioliTortelliniPomodoro. Pino's menu is simple, unfussy, although I had to look up what ravioli aurora was. It is decidedly not a tribute to Seattle's drab highway, homemade pasta filled with car dealerships and Korean barbecue joints. It is, in fact, a simple tomato cream sauce. I ran back to our table and quietly rattled off the memorized menu. Pino returned. (MORE LIGHTNING!) I ordered a special off the whiteboard, sausage ragù with penne, because it sounded good, but also because it was a test. Seasoned French chefs should flip perfectly creamy, sunny omelets, Neapolitan pizzaiolos should bake bubbly-crusted pizza margheritas, and New Orleans chefs should nurture dark gumbo roux. I wanted to judge Pino's cooking on something classically Italian—the ragù. "And you'll have the antipasti," he commanded, with not a question mark in sight. We gave up. We had the antipasti. But it was amazing! 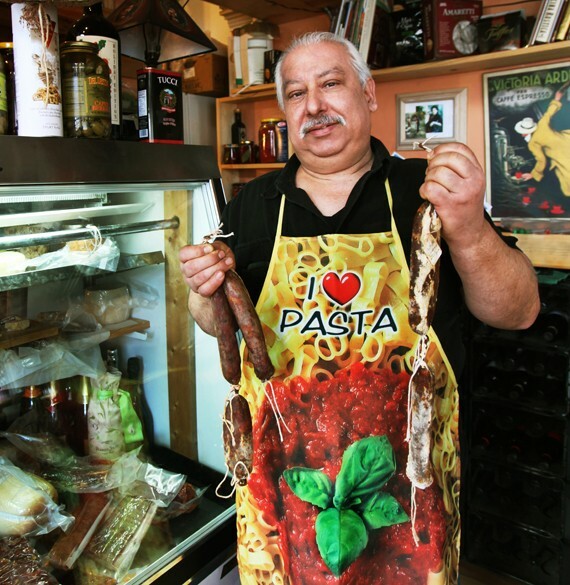 Pino makes all of his own salumi and sausages in-house, and he might tell you, with a triumphant snort, that he once beat Armandino Batali, of Seattle's Salumi fame, in some sort of a charcuterie duel. In the restaurant, a framed award from Seattle magazine reads, "Best Underrated Pork Product." The antipasti plate might feature some combination of guanciale, capicola, prosciutto, cacciatore salami, and coppa along with a couple small wedges of cheese, a few briny olives, and a basket of forgettable bread. A handful of local restaurants, including Tutta Bella and the Sand Point Grill, serve Pino's salumi. It's that good. The ragù arrived, along with glasses of house red, and a single bite snapped my eyes wide open. The gravy was thick and aromatic; the flavor was deeper than any of the poetry you wrote in high school. Chunks of slow-cooked meat nestled their way into the perfectly toothsome tubes of penne. Somehow, after hours of stewing, the tomato still tasted bright. Each bite was rich and silky, like your nonna's underwear. (I mean, I can only speculate.) But that ragù! Pino reappeared. "Everything is okay?" With each compliment I gave, his lips slightly quaked and shivered, until they finally stretched into a pleasant smile. (THE CLOUDS PARTED, THE SUN SHONE THROUGH!) The next time he visited our table, it was to chat and share slivers of homemade cheese. He told us he's divorced from his wife (she got the house in Lake Como) but married to his restaurant. He is his sole employee: host, chef, server, and dishwasher. Later, after the plates were cleared, he passed out shots of homemade limoncello. We clinked glasses with him and the soccer jersey guys and shouted, "Salute!" The storm had passed, the caterpillars retreated; he treated us to a slice of boozy limoncello cake. When it was time to leave, he kissed my cheeks, and when my boyfriend and I returned months later, he remembered us. We were greeted politely, offered menus, and, again, firmly told we would get the antipasti. This time we refused. Instead we ordered the verdure alla griglia, a platter of grilled eggplant and zucchini, roasted red peppers, and a few cracked green olives, a side dish I saw on every restaurant menu in Italy. We also ordered cheese ravioli, bathed in creamy pesto and sprinkled with toasted pine nuts, and penne con salsiccia, fresh marinara with slices of too-mild homemade sausage that could have used a stern look and a pep talk. He told us his friend hunted a deer, and he brought us chunks of deeply spiced venison salami from his personal stash. Sometimes a meal is about more than just the food. It's about where you eat it, who cooked it for you, and what mood you're in. Da Pino feels like a secret, a place you stumble into off the street where pots of ragù bubble and simmer, and spaghetti is served with a smirk then a smile. The kind of place where a single visit can make you feel like a regular.